Our much larger Annie Cocktail Ring inspires the smaller Allison Ring. The Allison holds a 10-12mm stone still not all that small. 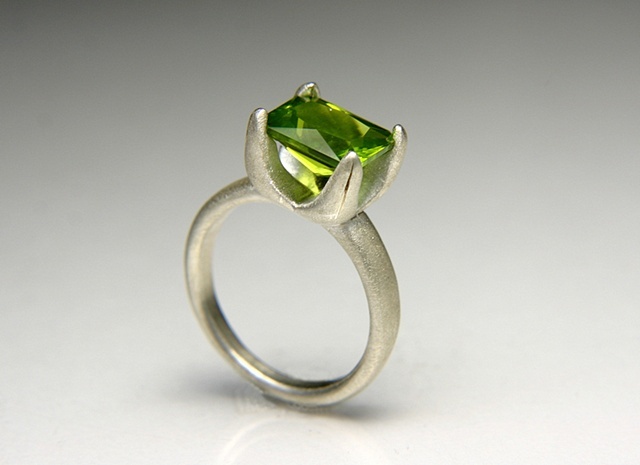 This ring has a nice sparkly 3.47ct, Acid Green Emerald Cut Peridot, with a brushed finish. SIZE: 7 1/4 and can be sized to fit you. #JC381, signed by Jewels Curnow.